Oberon the Irish wolfhound is off to Portland to smell all the things with canine companions, and, of course, his human, ancient Druid Atticus O'Sullivan. 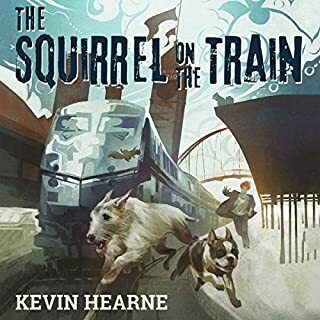 The first complication is an unmistakable sign of sinister agendas afoot: a squirrel atop the train. But an even more ominous situation is in store when the trio plus Atticus stumble across a murder upon arrival at the station. They recognize Detective Gabriela Ibarra, who's there to investigate. But they also recognize the body - or rather that the body is a doppelganger for Atticus himself. Can’t get enough of Atticus and Oberon!!!! Another great performance by Luke Daniels. Kevin provides a humorous doggy perspective to his Iron Druid universe, in man's best friend Oberon. Solving mysteries and mixing pop culture references this is a good quick listen. Two Iron Druid short stories available in audio for the first time, narrated by Luke Daniels! Luke's performance makes this very enjoyable with amusing voices and clear dialogue in all languages. Seriously love his voice. 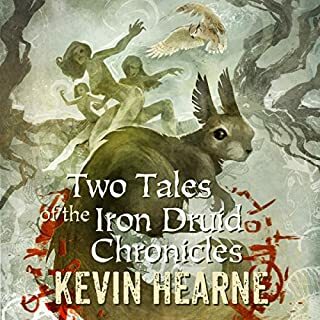 This is another good addition to Kevin's Iron Druid world filled with Atticus's well aquired paranoia, Oberon's witty banter and Graunulie's persistence.